I didn’t like any of these suggestions. A juvenile hummingbird weighs less than a dime. I am like Gulliver the giant in the land of Lilliputians to this tiny hummingbird. If his wing was broken, which I thought it might be because he never retracted it, can you imagine how much I would hurt him by picking him up? Besides can you imagine how terrified he would be with a giant like me picking him up and sticking him in a box? I have always preferred approaches with the least amount of intervention and trauma possible for both animals and humans, and I wasn’t going to change with this poor bird. So without opening the doors, I sat by him, and that was the extent of my intervention. He watched me intently and I held his eye contact steadily. This lasted for around 15 minutes. It was a remarkable experience. 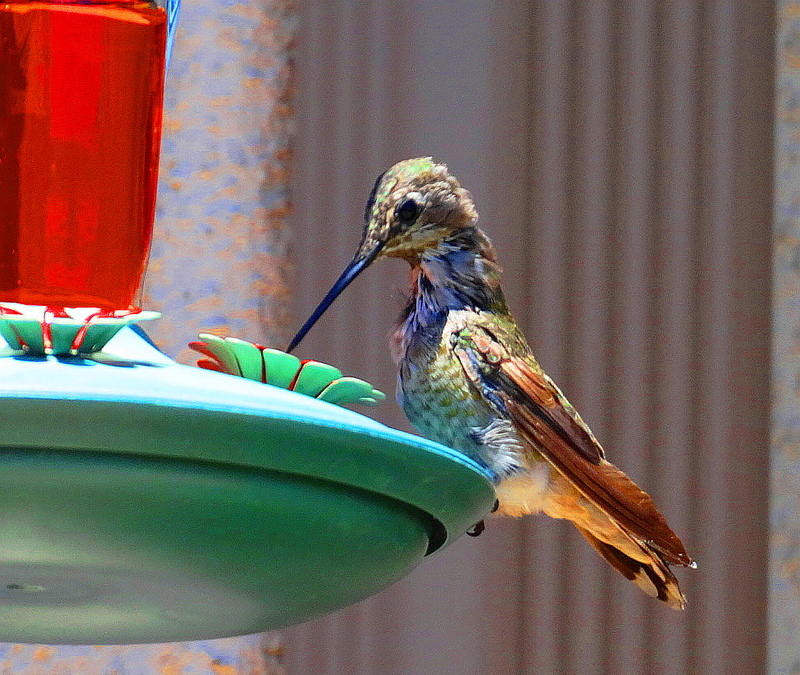 You have to remember that I am always around the hummingbirds and they are quite used to me. They fly inches from my head. I was pretty sure that I was keeping this bird company as he died. His trembling convulsions got worse not better and he never retracted his extended wing. A raven was buzzing around and there was no way I was going to allow him near the baby hummer. So I waited. No change. I do know that hummingbirds need to drink every 15 minutes or so during the day and can die of starvation rapidly due to their rapid metabolisms. All the hummingbirds were in the bushes watching. Not one approached the feeder while this one lay injured. It was all quite still. All of a sudden, with no preamble whatsoever, the hummingbird pulled in his wing, stood up and flew off to the oak tree where all the hummers hang out plotting their attacks on each other. I was stunned. I went outside, saw him on the tree, and quickly came back inside because I knew he needed to make it to the feeder soon in order to recover. An hour of so later I went to the feeder and took all these photos of him. He was absolutely unafraid of me and these are the closest, more detailed shots of a hummingbird I have gotten to date. You can see that he is a little worse for wear and still not completely fledged, but he is getting plenty of nectar. Now is this a story with a happy ending or what?? 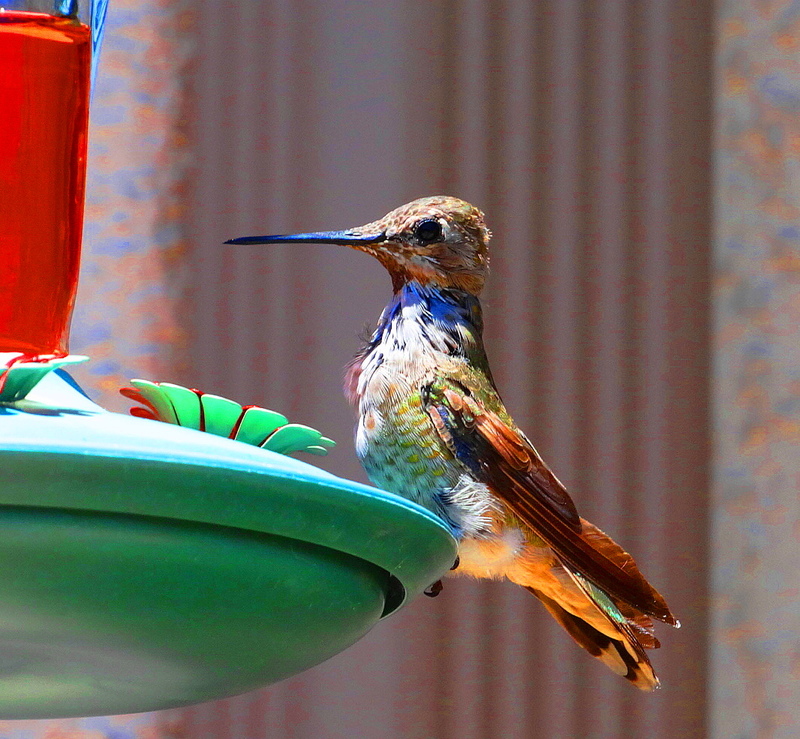 Cheers to you from all The Holler hummers, and their happy human! Bedraggled but still living! He’ll look even more colorful when the rest of his feathers grow in! What a great story with a nice ending!! I was nearly crying before the end of the story when the bird suddenly snapped out of it, and then I was so relieved! He does look a little banged-up, but I’m so glad he made it and will probably recover. Because of your wisdom and restraint you and he were able to share a neat and precious bonding time! I was also so upset that it took me my surprise and it was like a rainbow after a storm when he flew away. Thank you for caring Becky! Cindy, have I ever told you just how much I LOVE your photography? Awwww. Deeply touched Sahm and SOO good to hear from you my friend! 🙂 It’s been a while, I know. I was sitting here yesterday and I was telling Blu that I felt funny because I haven’t been to your blog in a good while. Felt like I was really missing out on something. Your photos are a little bit of paradise. If you haven’t seen the photography of Cindy Knoke, you haven’t seen photography. Okay, maybe you have, but still, CINDY KNOKE! Touched and humbled by your kindness. Thank you Sahm! 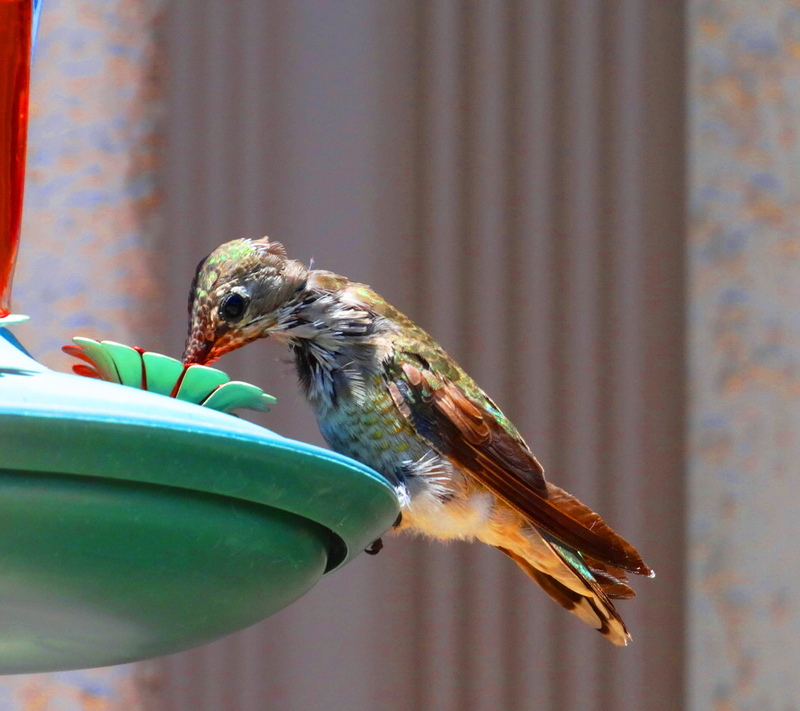 Hi Cindy, thanks for helping the little hummingbird! For good advice on helping any injured or orphaned wildlife, contact a licensed wildlife rehabilitator. For the name of one near you, call Wild Friends at Best Friends: 435-644-2001, ext 4460. They are very friendly and helpful. Oh so helpful!! Thank you for the numbers! Cindy, if you come this way again, perhaps a few tips on taking photos? 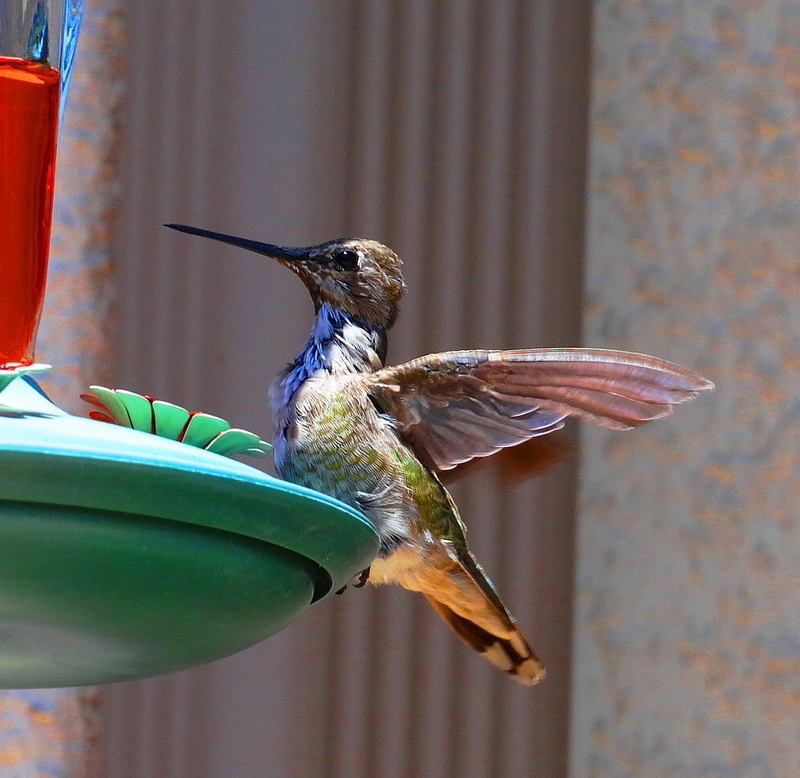 I really enjoyed the hummingbirds. Hooray for a happy ending!! What a beautiful little guy. Thank you for sharing. Have a wonderful day, Laurie. 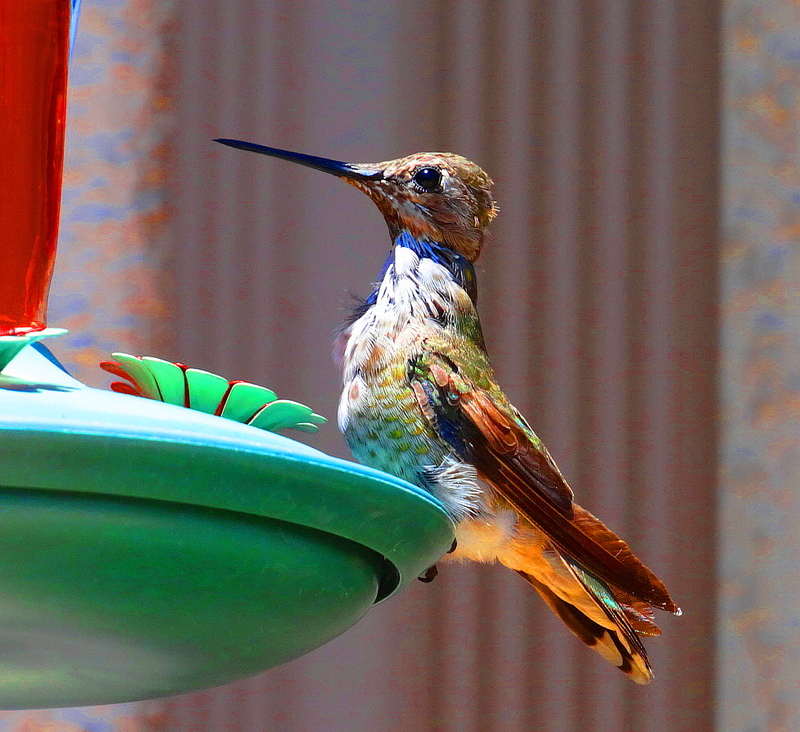 Lucky little hummer! What a fascinating time you must have watching them. Evidently you did just the right thing. Gorgeous pictures. They are so close up to the bird. This reminded me of last week one of this cute guy came close to me and I first thought it was a big bee. I was so scare to move about but was relieved to see it was this cute guy humming close to my head. Awww! back at you X2! Reblogged this on Growth Factor. So great to hear from you! I have missed you. Over to your blog now to see what you are up to! What a charmingly beautiful bird, like something from a fantasy tale for example Alice in Wonderland or Willy Wonka. And this one has a happy ending too. He makes me think of a patchwork blanket haha! Lovely photographs capturing him, Cindy! Cheers. I didn’t get that close… but while cleaning some debris from my creek – I had about a ten minute conversation with the great blue heron that had stopped by about 50 feet up or down the creek (I’m never sure the direction… is the water going away from you down) anyway it was nice. Glad your hummer is Okey-dokey. Great Blue Herons will come quite close and as long as you don’t scare them all is well. They seem to like our company. If you threaten them though, they use that dagger beak and aim for the eyes. This is what a rescue person told me when grabbing one for rescue that had adopted us. Wonderful birds! From one psychotherapist to another, as we already know – presence is an intervention. You did good! Love a good ending! Hummingbirds are so amazingly beautiful to me! Just beautiful shots, Cindy! So happy you liked the post! I love your photos and blog as well! Cheers to you & thank you! Me, a 70 year old macho, war veteran who is very careful about keeping my “soft side” under control is bordering on losing it !! Thanks for sharing this story and thanks for being there for the hummer. Now you have really touched me. How wonderful of you to react like this and to tell me about it. This is why I find blogging so rewarding. I get to meet people like you. THANK YOU everyday, in CAPITAL LETTERS, for your sacrifices as a veteran on behalf of all of us! We are so grateful everyday to our brave veterans. And thank you for caring about the hummer. Thanks for stopping by my blog. I loved this story and will be back to read more about your life on the frontier. genuinely keen of reading this weblog’s post to be updated on a regular basis. This blog ѡas… how do yօu say it? Relevant!! Thank you so much for your very kind re-blog and cheers to you! They are so tiny, that handling them when you don’t know what you are doing seems irresponsible. I am very glad it turned out the way it did.